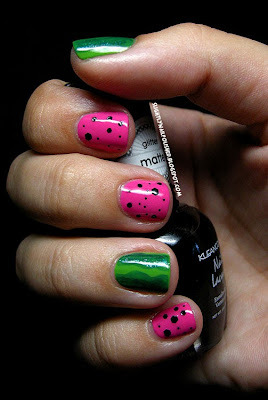 Slightly Nail Polished: Watermelon Nails! Hey everyone! I hope you're having a fantastic Thrusday! Mine is going pretty well. I have nothing to complain about which is always a good thing in my opinion. Plus, I have some good news. I got a job yesterday! 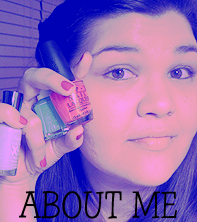 ^_^ I am so excited to get to work and make some money so I can buy more nail polish! So in case I disappear from time to time, I will be back. I just need to get into the groove of juggling work with my free time and nail art. Thanks for your patience. With all that said, I'm working on setting up a posting schedule. I'm planning on at least posting one day a week, more depending on my workload and whether or not I have something awesome to show you. Any ideas on what day(s) of the week would be best? Should I stick with posting on Thursdays or should I do something like "Mani Mondays"? Slap a comment on this post giving me your ideas. 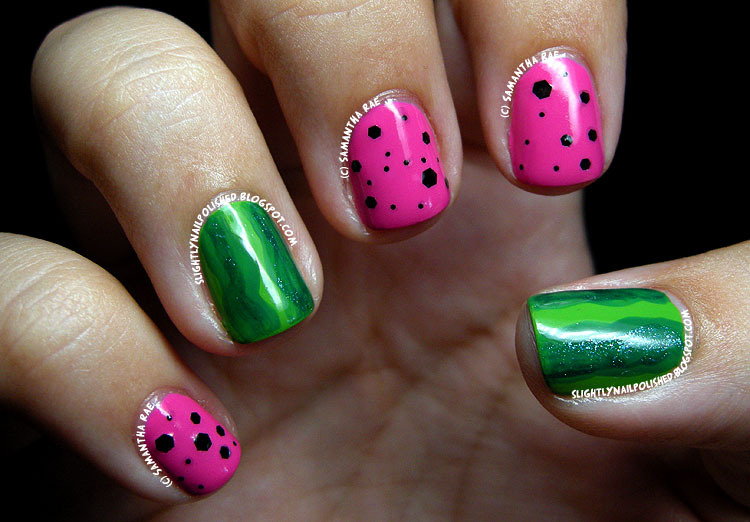 The other day, my youngest sister asked me if I had ever done watermelon nails. That's when it came to me that I hadn't! I feel like I had to change that as soon as possible. So this design is for you, Liza! And I really like what I ended up with. It's a cute, fun, and really easy design. For my pinky, middle and index fingers, I started with a base color of Knockout Pink by Sally Hansen Xtreme Wear. Once that dried, I grabbed my chunky, matte black glitter polish (Beyond Time & Space by Kleancolor) and picked out some large and tiny glitters and placed them randomly on the nail. The rind of the watermelon was a little trickier, though in no way was it hard. On my thumb and ring finger, I started with a base color of Just in Lime! by Sally Hansen Xtreme Wear. 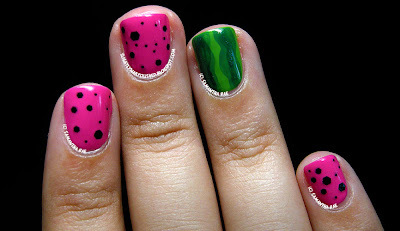 I then took a slightly darker green (Starboard by China Glaze) and painted two squiggly, messy stripes down each nail. When that was dry, I took a sparkly green (Watermelon Rind by China Glaze) and very lightly painted over the darker green. I finishes all my nails up with a layer of topcoat, Seche Vite, and they were done! Easy as that. I hope you all enjoyed this easy design for summer. I can't believe we're already so close to August. Yikes! Before I know it, I'll be planning some Halloween nail designs. Wow! Oh, also, MERRY CHRISTMAS IN JULY!!! !